I know that Memorial Day seems like the beginning of summer. But summer doesn’t actually start for another month. 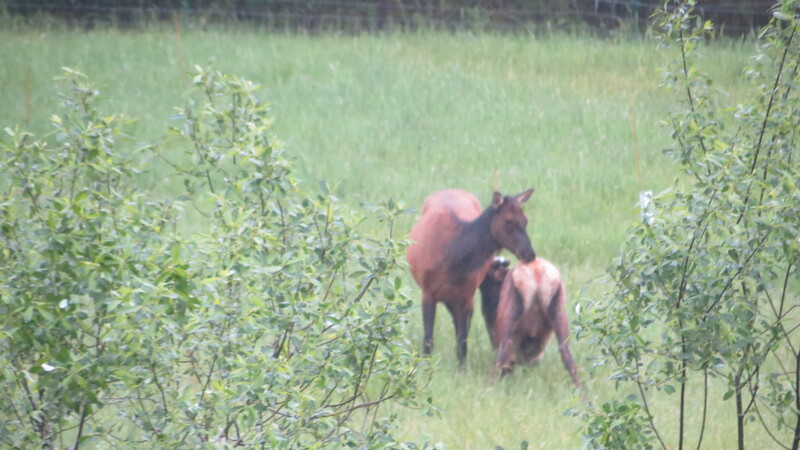 So we are still seeing things spring up and out and through. 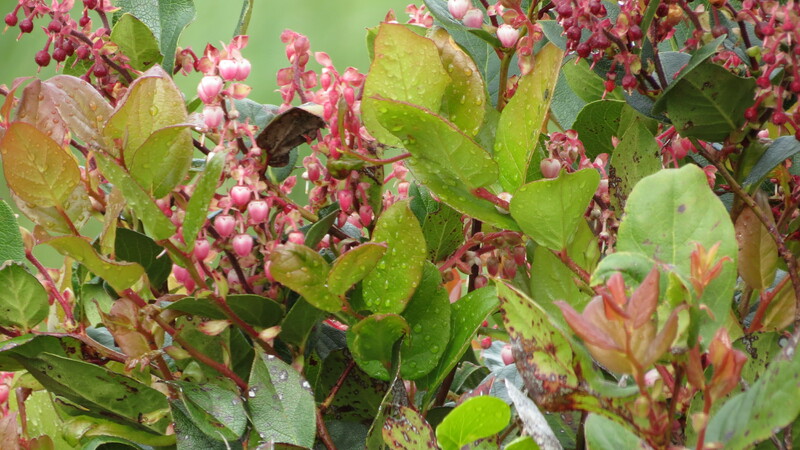 The delicate pink flowers on the Salal shrubs will turn into plump blueberry-like berries. Those close to the ocean get a light coating of salt on the berries; which makes them especially yummy. 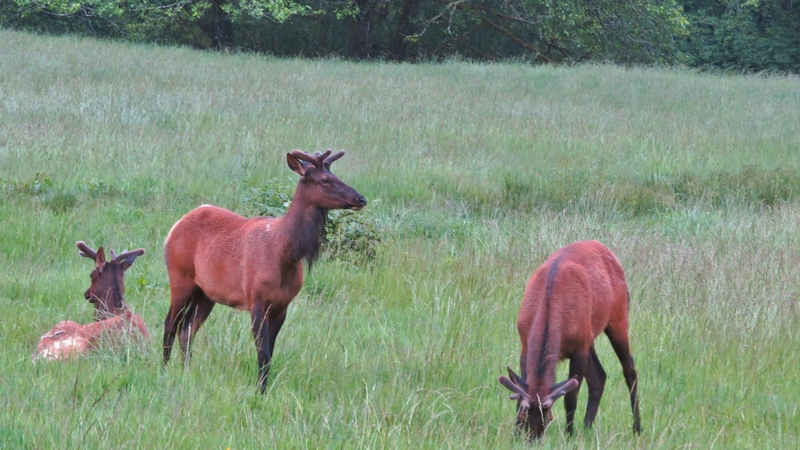 These cousins only had spikes last year. We’ll see how many points they grow this year. This was taken on a different day so it could be one of those in the previous photo for all I know. The moss is getting thick in the Alsea River too. 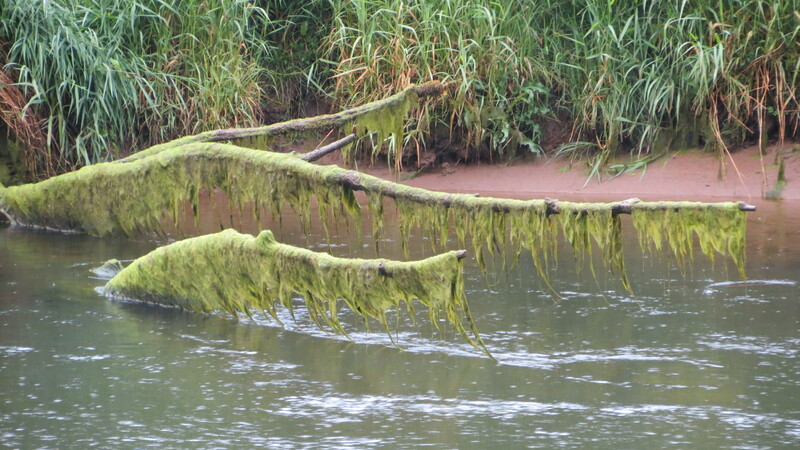 We’re still not sure if this moss has grown on the branches or if they just caught it at high tide? It sure seemed to happen quickly. 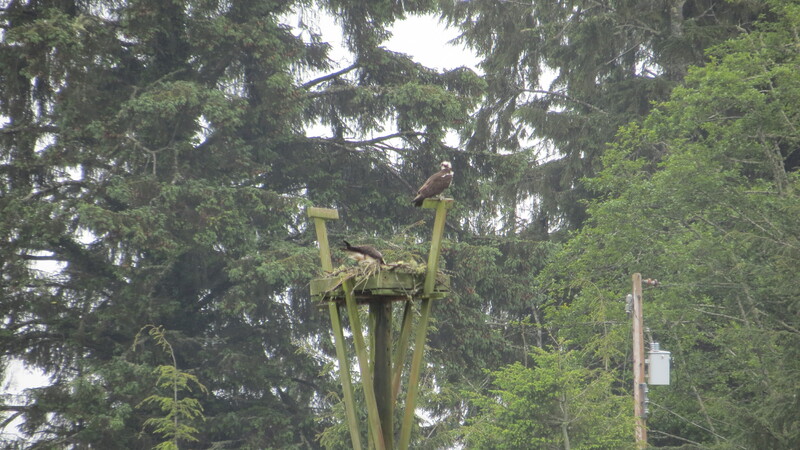 I hadn’t seen the osprey fishing in our front yard all week. My theory was that the chicks had hatched. Based on what we saw today (above), I’m sticking with my theory. The algae bloom makes the water look thick and almost chocolatey – if it weren’t for that slight greenish tint. Not so inviting for swimming but lots of marine life love it. The campgrounds are sprouting tents! 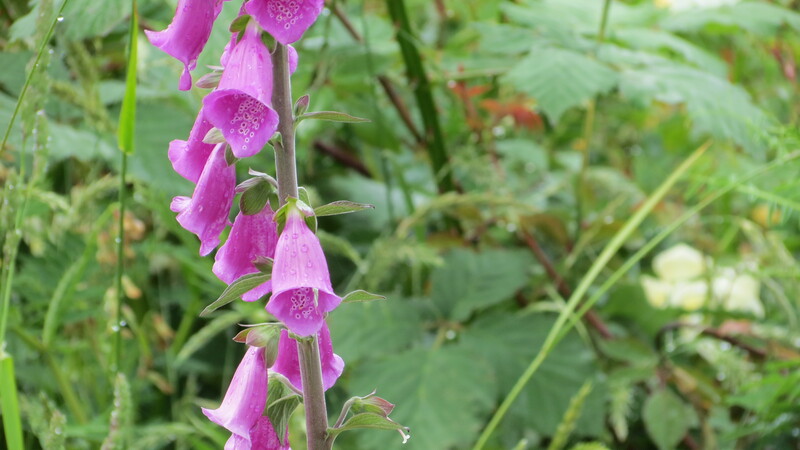 We’ve really had a dry May so we really need the rain we’ve seen this week. But a break for Memorial Weekend would really be nice. Some people’s children never grow up. I’m trying to figure out how she can nurse for a whole year?! 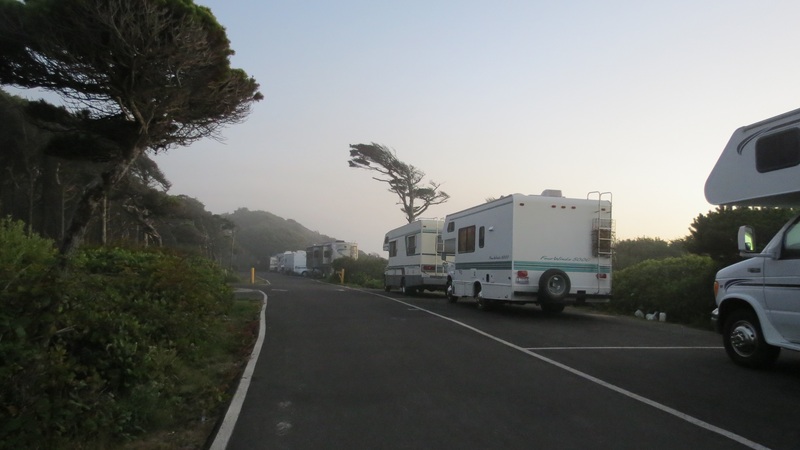 Sutton Campground is in the coastal forest area at the north end of the sand dunes that Florence is so well-known for. I’m not sure if it’s in the 2nd or 3rd growth period of the huge trees that Oregon is also well-known for. But I am always intrigued by the layers of growth here in Oregon. Not only does moss grow on trees, but ferns grow out of the moss. 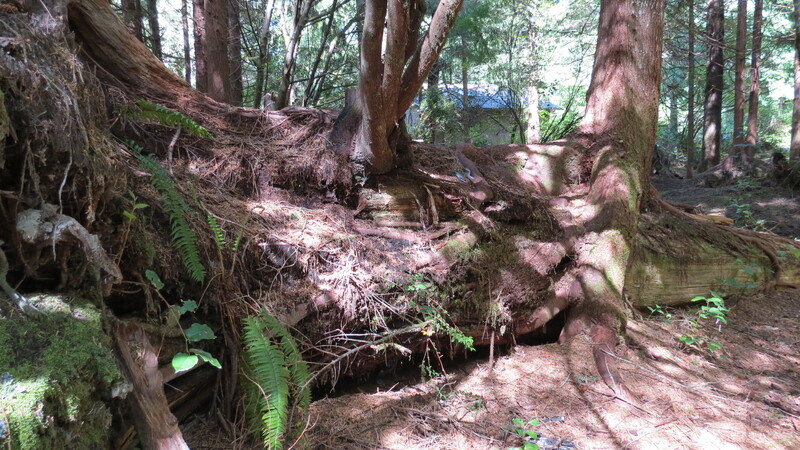 Here you can see that 2 trees are growing on the dead tree that fell (probably) decades ago. Sea Lion Caves rolled back the prices for their Founder’s Day celebration yesterday (Apr 27). And what a beautiful day to be on the Oregon Coast! Tokatee Klootchman State Natural Site is a small parking area along Hwy 101 of the Central Oregon Coast. It’s about 16 miles north of Florence. We watched whales feeding here last summer. Access a narrow path to the beach by walking around the fence to the left of the sign. Always lock your valuables in your trunk. If you are a horror movie fan, you may recognize a house used in an 80’s horror flick. 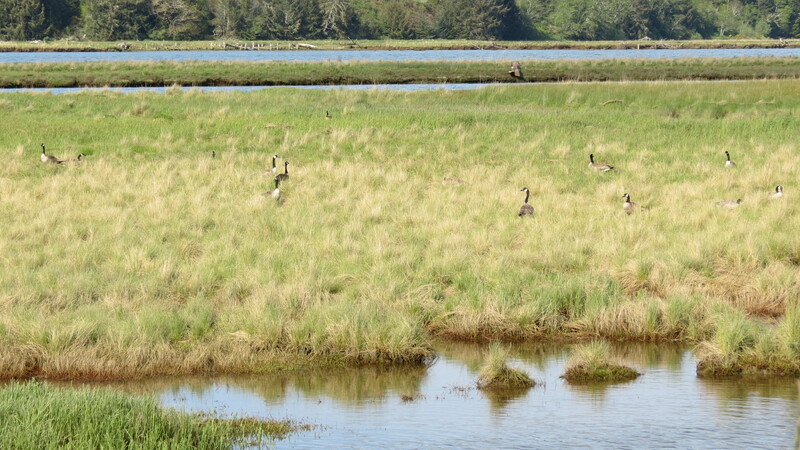 Back up the Alsea Hwy, just out of Waldport, the geese are starting to pair up and make their nests on the bay side of the Eckman Lake causeway. Just a quick jaunt between Tillicum Campground, near Yachats, and Sutton Campground, near Florence. Yesterday was bright and sunny and today it’s cloudy again. But we didn’t get rain showers until after noon. A perfect day on the Oregon Coast and a perfect end to 2012. As the sun starts to go down over the Pacific people find a place to pull off Hwy 101 to watch it set. We like to call them “meerkat moments” because we all look like a bunch of meerkats as we are lined up gazing, silently, at the sun. On this late September Thursday evening, there’s hardly any traffic on Hwy 101. 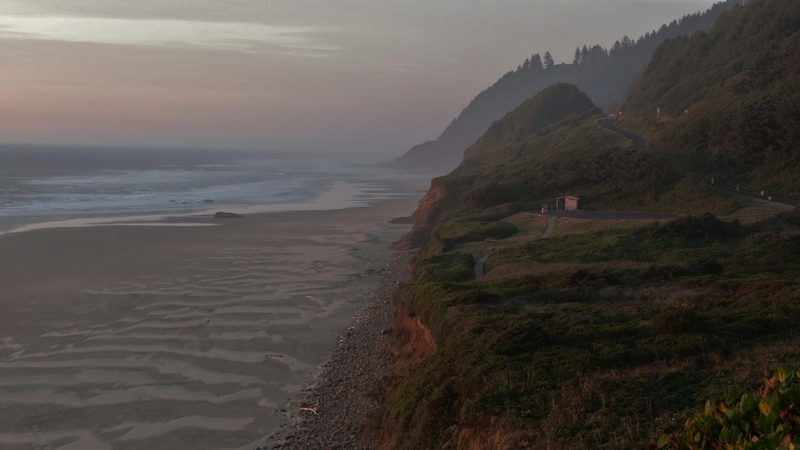 Rock Creek and Cape Perpetua Campgrounds closed this week. Wish we could keep them open longer for the few people who would camp in them! But there are just not enough campers to keep them open. 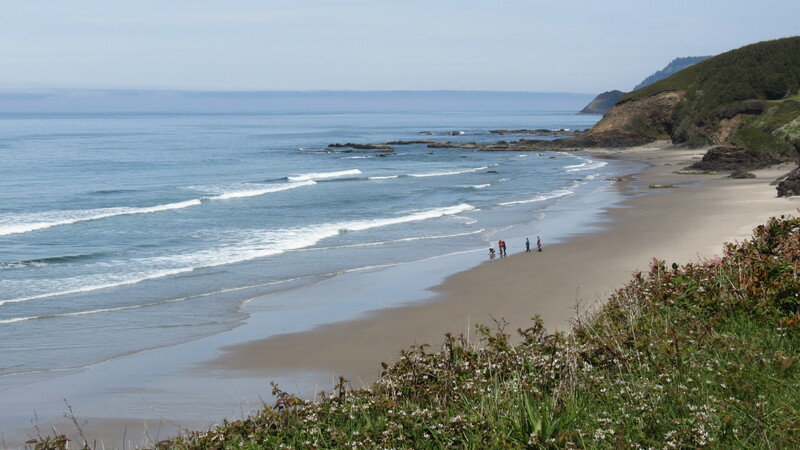 Tillicum, Alder Dune and Sutton are beautiful campgrounds just off Hwy 101. 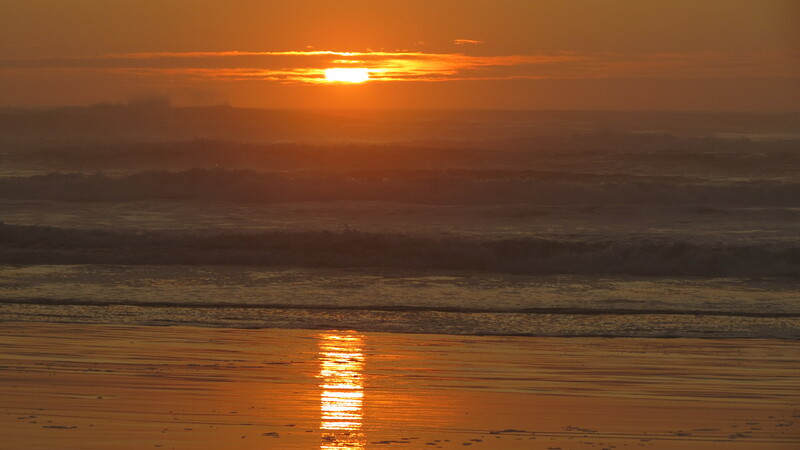 The drive between them (Yachats to Florence, Oregon) is worth spending a day on; tide pools, hiking, vistas, whale watching, beach walking, surf fishing, shellfish harvesting, Sea Lion Caves, Heceta Head Lighthouse and, of course, the sunset. It think we’re getting some smoke from the Sisters wild-fire out here on the Oregon coast. I can see blue sky above me but the horizons are fuzzy. Fog doesn’t usually turn the sunrise orange so I’m thinking it is smoke. This is only a 6.1 foot high tide. 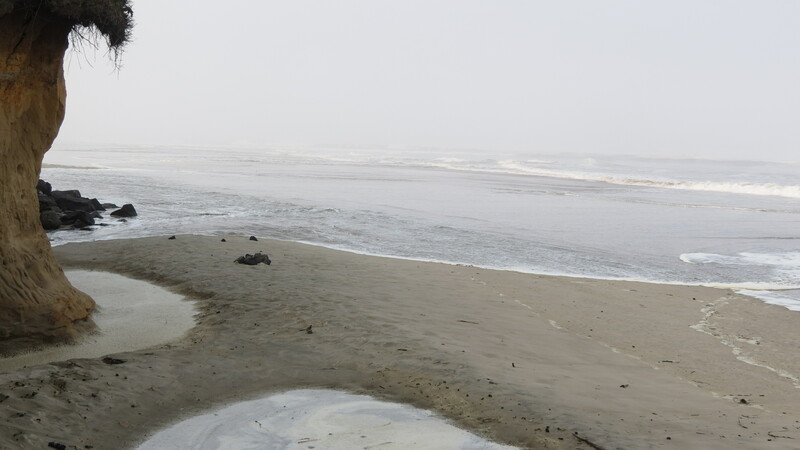 The waves haven’t come near the bluff on Tillicum Beach since June. This pic is just around the corner from the north stairway. Tillicum Campground’s appeal are the beachfront sites. We try to keep all three loops open as long as we have enough customers to warrant keeping the 3 restrooms clean (this isn’t the only campground we have to provide for). September is a pretty popular month with the RVers. 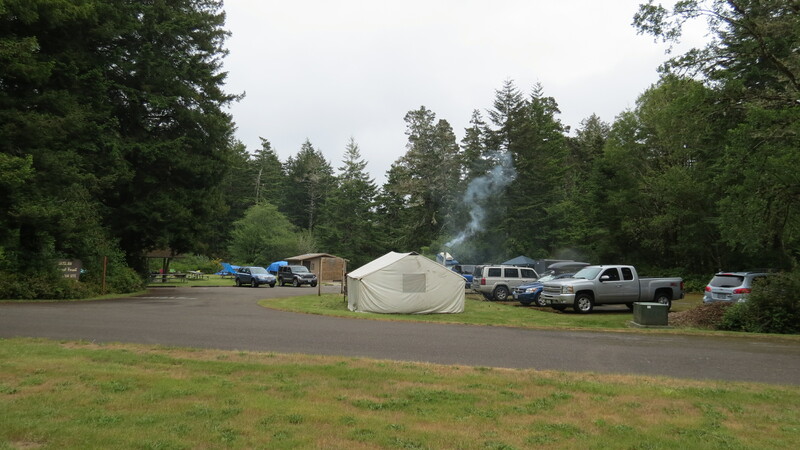 Tillicum Beach Campground is a US Forest Service campground that is open year-round. We honor the Senior and Access passes. Tillicum has 7 electric/water sites. Tillicum is about a mile south of Beachside State Park, between Waldport and Yachats. Sutton Campground, near Florence, has 20 electric sites and is also open year-round. All sites are first-come-first-served from Labor Day until May. Today was beautiful and the smoke produced a beautiful sunset. 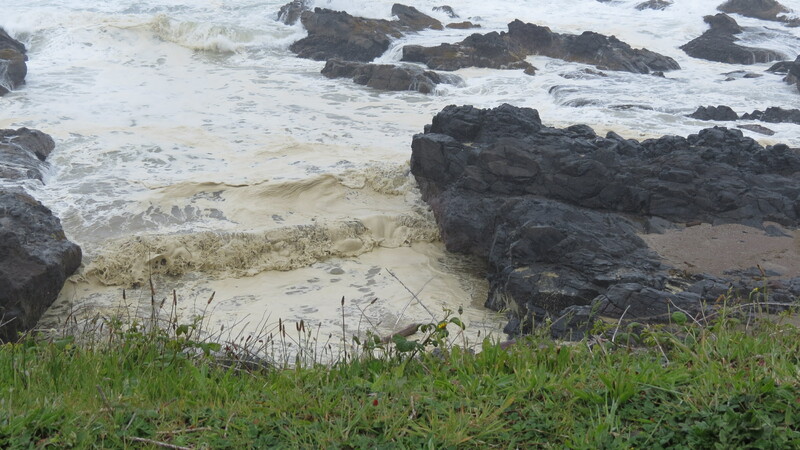 There’s not much beach in Cape Perpetua. 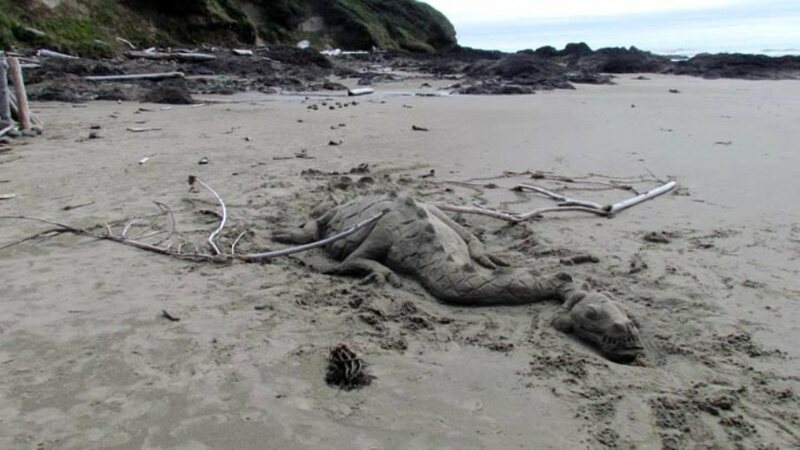 But at low tide, all kinds of critters come out of the sand. 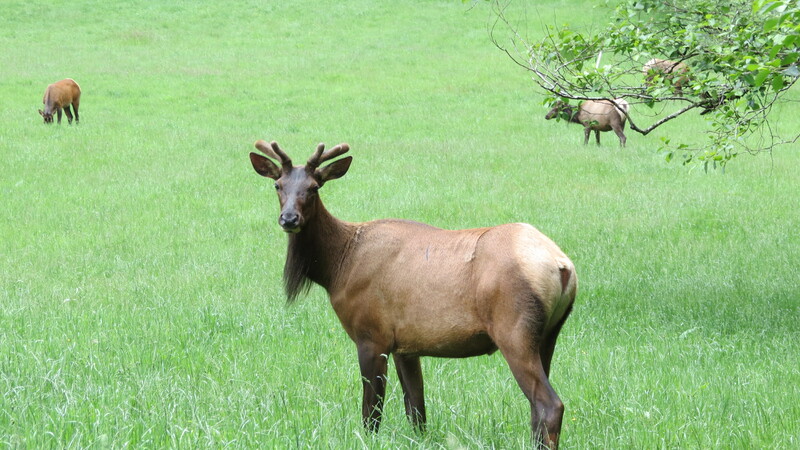 Our campgrounds are full! We always have a few openings on Saturday but you have to be in Tillicum, Cape Perpetua or Rock Creek before noon to catch one when it opens. 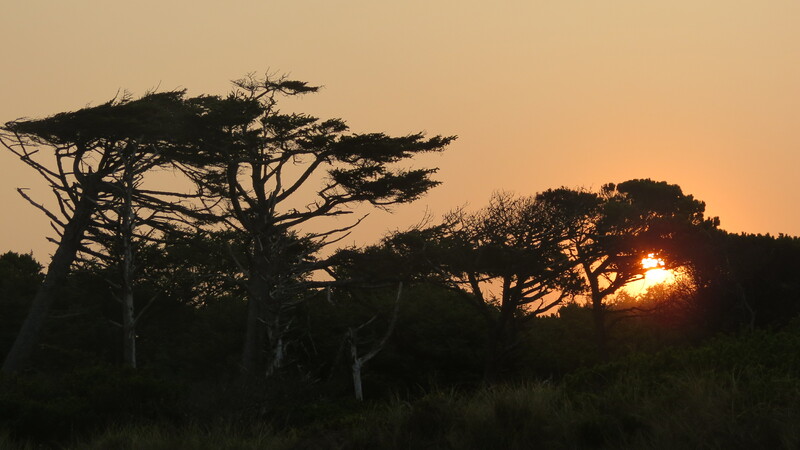 Alder Dune and Sutton campgrounds, 5-6 miles north of Florence, have openings later in the day. Sutton has 20 electric sites. There is NO ATV access to the dunes from Alder Dune or Sutton. 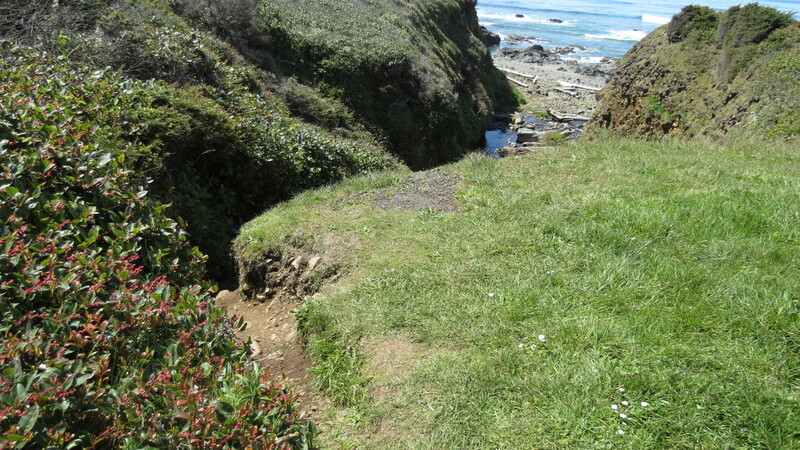 Blackberry campground is a short drive from Waldport, up the Alsea Hwy (34). 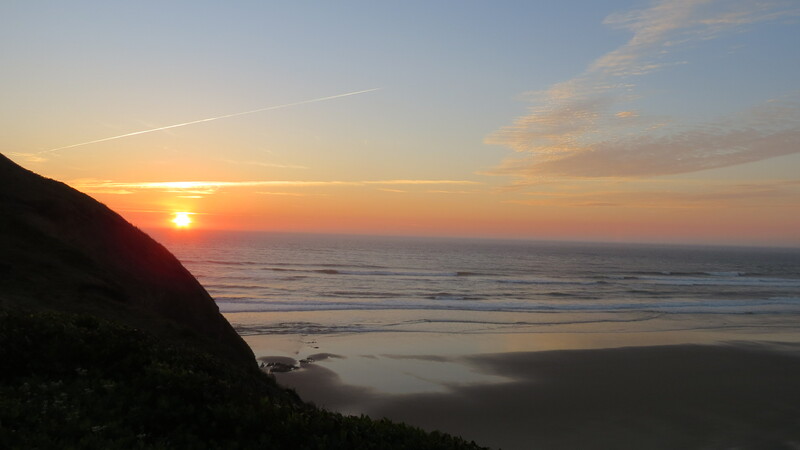 Enjoy the beach around Waldport/Yachats during the day and enjoy warmer temps along the river at night. Call 541-547-3679 for more info (8am to 9pm). 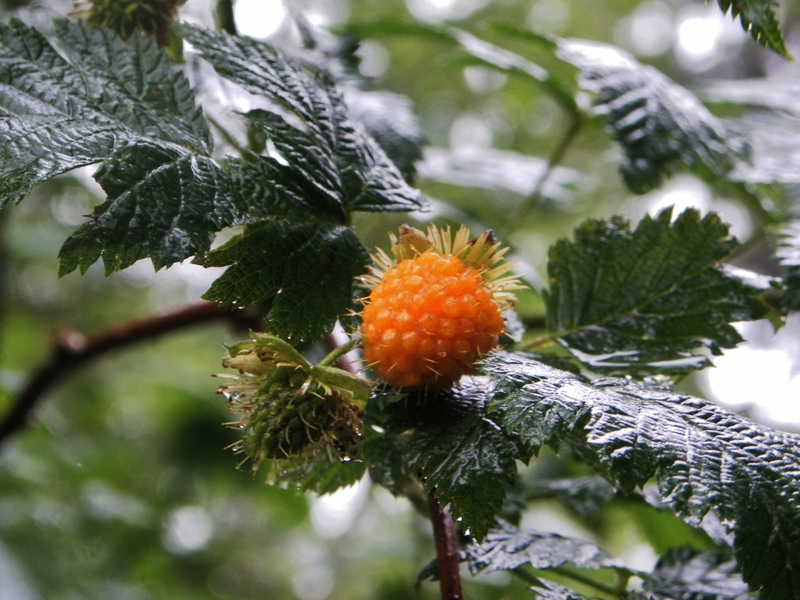 The salmon berries are already ripening in Alder Dune Campground. Fish the stocked lakes for rainbow trout. Trout for dinner and berries for dessert! Florence Oregon’s Rhody Days was last weekend. 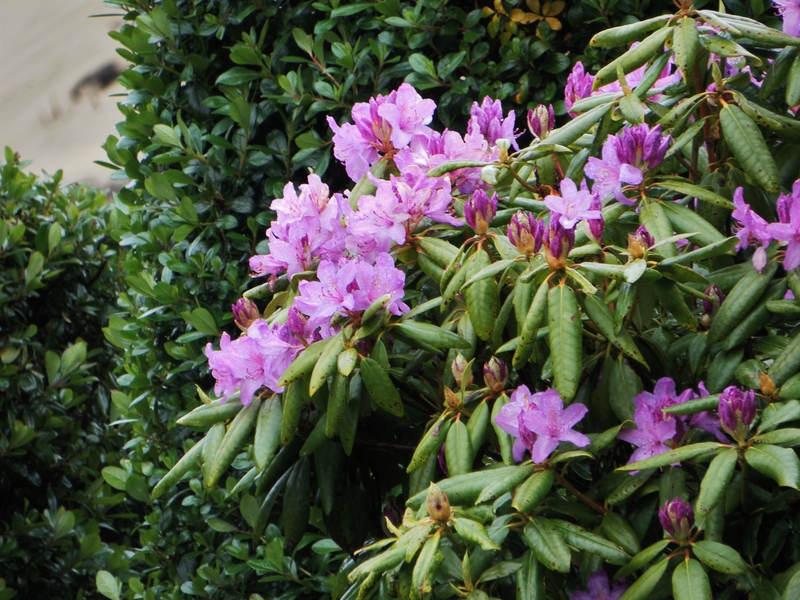 I don’t know how they get all those rhodies to bloom in time for it every year? I love the deep red ones. They’ll all still be in bloom for Memorial Weekend. 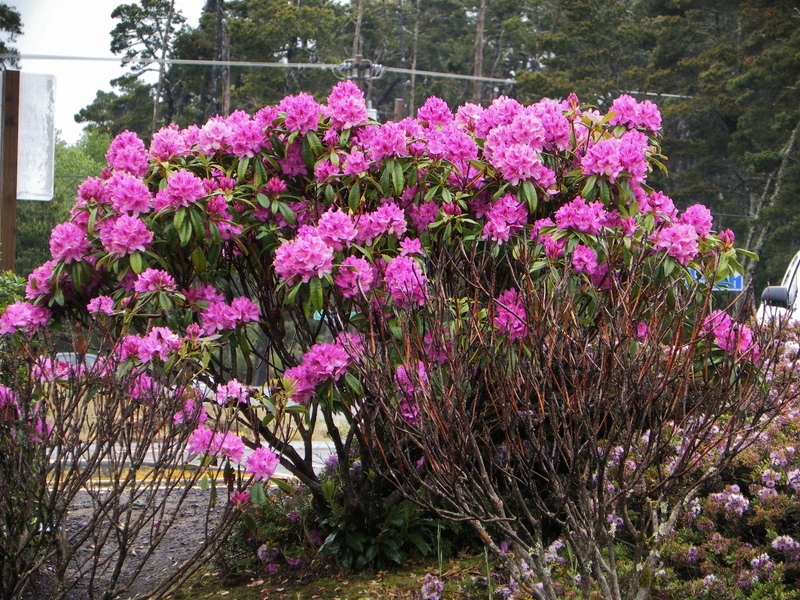 You’ll see many pink rhodies in our campgrounds (Sutton and Alder Dune, north of Florence). 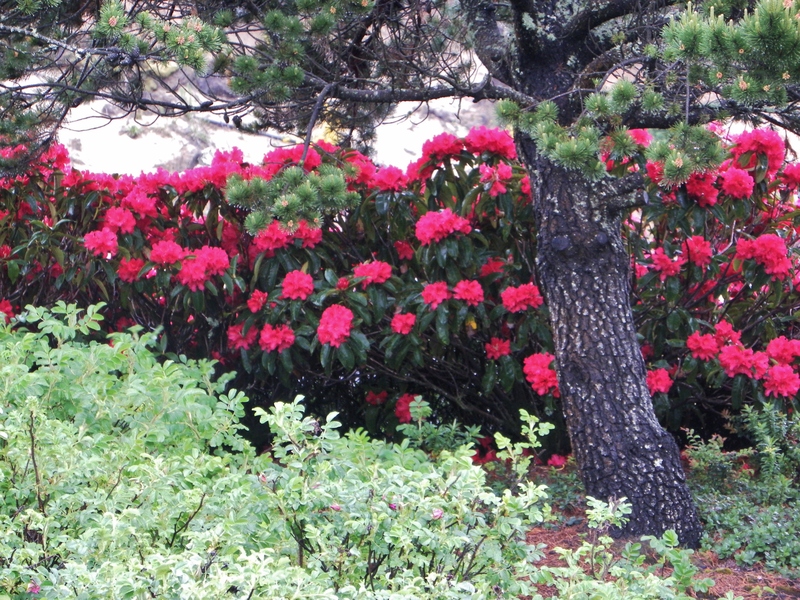 The pink ones are the wild rhodies. 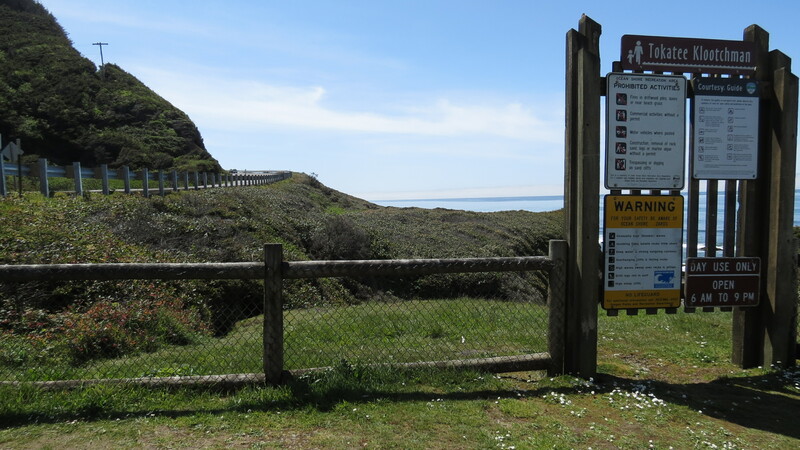 Notice: There’s no access to the dunes for ATV’s from these campgrounds. But access to the dunes is a short drive away.